Hutterites: The Small Religious Colonies Entwined With Montana's Haute Cuisine : The Salt The peace-driven Anabaptist sect, made up of families who live and work together, has built a relationship with high-end resorts, supplying poultry, produce and bread for chefs. 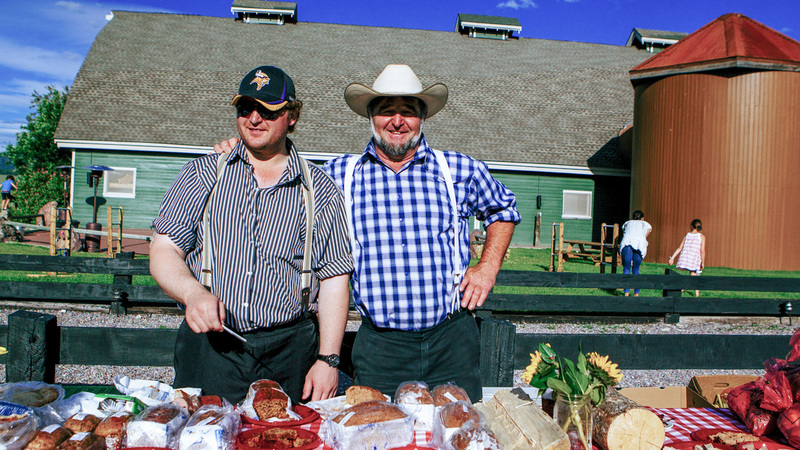 Brian Kleinsasser, left, who works in the hog barn at Cool Spring Colony, helps Jake Waldner set up the Hutterite table during a Long Table dinner event at The Resort at Paws Up. On a rainy Sunday evening following the first of its Long Table dinner series, the kitchen staff at The Resort at Paws Up collectively dug into a strawberry-rhubarb pie. "We brought out the forks and ate like we'd known each other forever," recalls Sunny Jin, executive chef at the Montana dude ranch and resort. The pastry was a parting gift from Jake Waldner, a Hutterite who'd helped out with the dinner. He couldn't stay to enjoy dessert with the crew, however, as he had a five-hour drive home to Cool Spring Colony in northern Montana, where he resides with about 80 other Hutterites. Often compared to Amish or Mennonites, Hutterites are a communal people belonging to a peace-driven Anabaptist sect that lives by the principle of non-resistance, the practice of not resisting authority even when it is unjust. Nearly 50,000 of them live around the Western U.S. and Canada in colonies of 80 to 150 people made up of families who live and toil together. Faith, family and hard work make up the core values of the Hutterites. "We believe just to treat other people like you want to be treated. And hard work has never killed anybody," says Waldner. Waldner has been working with Paws Up for 14 years. His colony supplies the resort's kitchen with most of its chickens and ducks, some produce (radishes, onions) and occasionally bread. It's an odd juxtaposition, Hutterites supplying food for a resort that offers luxury glamping for tourists at upward of $500 per night. But Waldner doesn't see it that way. The relationship first began when he met the Paws Up chef during the weekly farmer's market in Missoula, Mt. "We got to talking, and he told me, 'Come on over, we use things like [chicken] here all the time.' From that day we clicked, and a great relationship began," says Waldner. The deal between the resort and the Hutterite colony was sealed on a handshake — and each has kept their side of the bargain. Though several previous chefs have moved on, they still make a point to keep in touch with Waldner. "The funny part is, all those guys keep calling me," says Waldner. "They're great friends." Jin, who came to Paws Up in December 2017, orders about 60 chickens and 40 ducks every two weeks. He respects the friendships established between previous Paws Up chefs and Waldner, Jin says, and he's been honing in on the business side of things with Cool Spring Colony. "When I came on board, I realized there was a strong partnership here with the Hutterites that was more based on friendship and bartering than monetary gain," says Jin. "We're trying to keep that relationship going." Though Hutterites aren't widely known outside the states of Montana and South Dakota, a National Geographic TV show that first aired in 2012 aimed to shed some light on the community. But American Colony: Meet the Hutterites wasn't the most accurate portrayal. "It's such a false reality," says Waldner of the show, which all but omitted religion — a fundamental element of Hutterite life — and portrayed other untrue situations, such as students attending school outside their community (rare) or dating non-Hutterites (unheard of). "There's a lot under-the-table stuff that was acted out and not even close to [how] real Hutterites live," he says. "People who know us, they all know different, so that's what counts, I suppose." Waldner is "the chicken boss" at Cool Spring. He's responsible for raising about 8,000 chickens, 1,000 ducks and 1,000 turkeys each year on the colony's state-of-the-art farm, which encompasses 9,600 acres, including a 12-acre garden. The animals are raised free range, without hormones or antibiotics, and are fed barley and wheat grown on the farm. After they're processed and packaged, Waldner himself delivers them to farmers markets, local grocery stores, individuals and establishments like Paws Up, often leaving the colony at 2 a.m. — even before his chickens are up — to arrive first thing in the morning for his customers. The Hutterites don't do it this way because it's trendy or in demand, though. It's simply how things have always been done. "I have maybe had two or three negative things [said] in my 14 years of doing business," says Waldner of selling his birds. "Most people just love 'em." Contrary to what one might expect, Hutterites — in comparison with some other strict religious communities — have all the latest technology, from GPS-driven tractors to smart phones and tablets; it's a necessity for such a large operation, Waldner says. A normal day for Waldner starts with coffee in the community kitchen, chores such as feeding the chickens and gathering eggs, and breakfast prepared by his wife. Then it's back to work, chipping in to help wherever he is needed once his animals are taken care of. The women of the colony aren't out in the fields, instead they work in the gardens or the community kitchen. At Cool Spring, they bake about 200 loaves of banana bread and 200 loaves of zucchini bread or orange cake a week, says Waldner (he's partial to the orange cake.) Many loaves are baked on Wednesdays in time to sell at local farmers' markets on Fridays and Saturdays. The women also take turns preparing meals for the entire colony every day, and bake all the bread they'll need for the week on Mondays. Each part of the farm — fields, blacksmith, hogs, etc. — has its own boss. Men are expected to take care of their own chores first, then pitch in wherever they are needed. They're working sunup to sundown most of the time, though on rainy days, "We goof off like anybody else," admits Waldner. For him, fun is getting the chance to interact with his loyal customers every week or so — and sometimes that means meeting celebrities like Sugar Ray Leonard, whom he once encountered during a delivery to Paws Up. "I used to be a big boxing fan," says Waldner. "He was one of my favorites."